Google Android is one of the leading mobile operating systems in use today and open source. Android developers are in great demand now, applications like Flipboard, WhatsApp Messagner & Instragram are changing the way we use information or communicate using our smart phones or tablets. And not to forget the games like Angry Birds and Subway Surfers. There is lot of potential to make money once we get into Android development. This is a quick start article for those who want to start development in Android. The focus of the article is application development and not game development. Developers who know how to use XML and programming using object oriented language like C++ or Microsoft C# and Java developers can feel at home. Android being open source, all development tools are available for free. Download and install the following tools to start development in Android. ADT is a plugin for Eclipse IDE, Eclipse is again open source and free to download. You don’t need to download Eclipse separately. ADT comes bundle with Eclipse, just download ADT and follow the instructions to install. 1. Have the target Android device (smart phone or tablet) connected to the PC using a USB cable (enable debugging option on in your device). 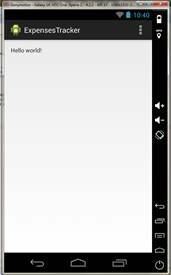 Android default emulator is painfully slow, so it’s highly recommended to setup Genymotion emulator. All applications need a database to store and retrieve information. Sooner or later you are going to need a database for your app. Android supports SQLite, an open source embedded database system. 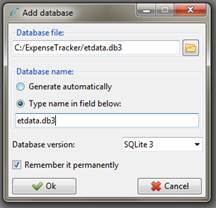 SQLiteStudio is a Database Manager where you can create and manage database artefacts like tables & views. 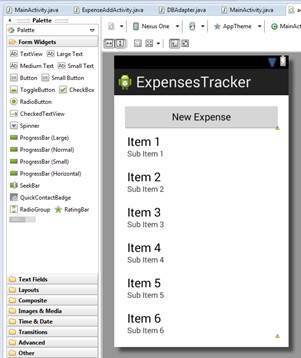 We’re going to create an Expense Tracker app for Android. 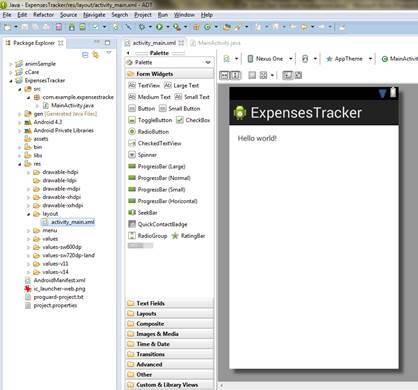 It’s a simple application that lets the user manage their expense list with details like Expense title, Amount & Paid. 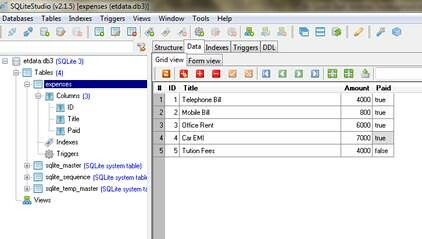 Double click on expenses table and use the Data tab to enter some sample data. Save and close the database, we’ll use the data file soon in our application. Keep Clicking Next (keeping the default values) until you reach Finish, click Finish to create the project. Once project is created, you will see the project opened in Eclipse. res – Stores all project resources like images, layout etc. assets – Stores project assets like text, database etc. In Android, a project is made up of Activities . An Activity is similar to web page, form or window. 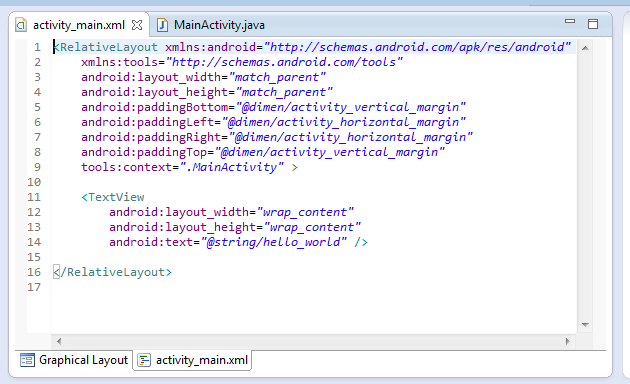 We create the layout of the activity using XML and create the Activity class using java. Be default, the project has created an activity (MainActivity.java) for us with a layout (activity_main.xml). 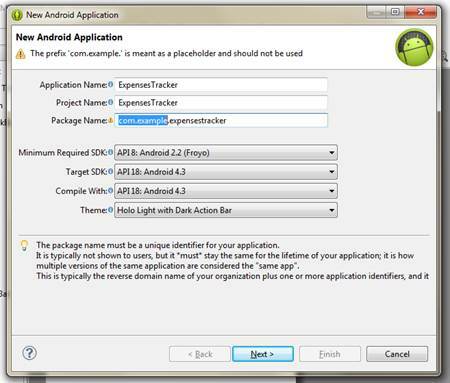 Right Click on the project and select Run As \ Android Application to run the project in emulator or the connected device. 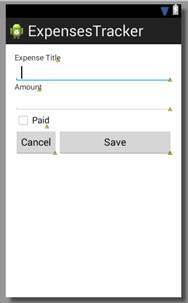 We’ve created two UI elements in this activity, Button for ‘New Expense’ and ListView for displaying list of expenses. This file contains all database operations and provides user friendly methods to interact with the database like selectExpenses, insertExpense etc. 2. Add Click event to ‘New Expense’ button and call ExpenseAddActivity activity that consists of layout (expense_add.xml) to add new expense items. We’ll create the activity and layout files soon. 3. Call and create fillExpenses() function that interacts with the database and iterate expenses table to fill the List with expense items, we’ll create ExpenseType class to map with the expenses table records, and finally we connect the ListView lvExpense to the adapter mExpenseAdapter that we will create later. 5. Create mExpenseAdapter based in BaseAdapter that is one way of connecting to the ListView control with collection or array objects. This activity uses the expense_add.xml layout file and calls the insertExpense method of DBAdapter and returns to the MainActivity. This layout file consists of UI for adding new expense items. 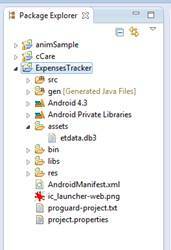 We need to add the ExpenseAddActivity activity to AndroidManifest.xml file to be able to call the activity from MainActivity. 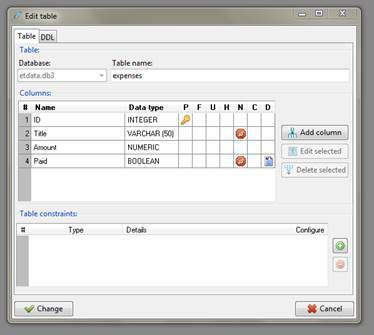 This layout file is used to render expense items in ListView. Run the project in emulator or connected device to see the result. Use ‘New Expense’ to add new expense item. 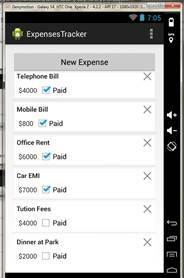 In this article we managed to create a complete app for expense tracking. We have not got deep into each and every step of the code but the code being simple and easy to understand, the same framework can be used to create more complex business applications. It all boils down to layout files with UI widgets (Textbox, Buttons and List controls) and Activities (Java files) that are similar to web pages.